FUMICINO, Italy (CNN) -- Under a canopy of elegant Italian pines, the foundations of a mini Roman Coliseum are at once unmistakable and exhilarating. The structure at "Portus," the Romans' ancient Mediterranean port, has remained undiscovered for eighteen centuries until now. University of Southampton archaeologists have just this summer uncovered the remains of an amphitheater, a Roman warehouse and the ruins of an Imperial palace even though archaeologists have been digging at this site since the 19th Century. "There is only one imperial Rome, and Rome only had one imperial port and Portus is that port. In a sense it is trying to give an idea not only of the importance by virtue of that but also because the archaeological potential of it is huge," adds Keay. An exquisite white marble head of a statue was found close to the site of the amphitheater. 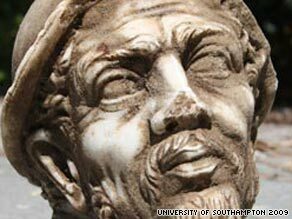 Experts believe it could be a bust of Ulysses or possibly a Greek sailor. Rare and finely carved fragments of columns have also been found. "When we first started the project, everything you would have seen here was grass, a couple of trees," explains Keay. "We very nearly fell into a hole because we couldn't actually see what we were doing. Clearly we have completely exposed this area and because these buildings are so big it is only by uncovering large areas of them that we can actually understand their function and their development," says Keay. The site is ironically less than a mile from Rome's modern transport hub, Fumicino International Airport, and this discovery owes more than a nod to modern technology. Using modern sensors, ground-penetrating radar and probes, researchers complied computer images of what lay beneath. They were dazzled by what modern technology revealed about the ancient past. "So we then played around with it on the computer screen, we did a virtual reconstruction of it and amphitheater shape grew out of the screen and we knew that we were on to something very special," says Keay. The excavations in Fumicino, Italy, just outside Rome, continue in a joint project named "Portus" with the University of Southampton, the British School at Rome, The Italian Archaeological Superintendency for Ostia and the University of Cambridge.